Top Gear’s Stig to Get LEGO Minifig? The Age is claiming that the test driver on BBC’s Top Gear automotive TV show is getting his own LEGO minifigure. The Stig is the normally anonymous racing driver on Top Gear, dressed in all white, complete with a white helmet and blueish visor that is always kept down. It wouldn’t be surprising for a couple of reasons. One reason, the presenters are major LEGO fans – you can read about James May’s attempt at building a house completely out of LEGO here (TopGear.com). Eventually the over three million bricks that made up the house were taken to Legoland at Windsor to be used in an annual building contest. There were even some custom minifigs made of Jeremy Clarkson, James May, and Richard Hammond. 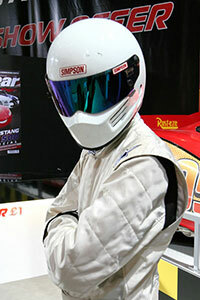 The Stig is also very recognizable – there are a few hundred million viewers of the show.